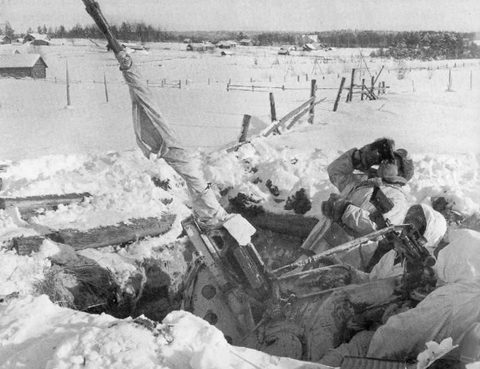 Winter War Army Operations: On 3 January 1940, the Finns reinforce the effect of the elements on the trapped Soviet 44th Rifle Division by targeting Soviet field kitchens. Finnish snipers target Soviet officers. Soviet troops have received permission to butcher horses for food. The most advanced Soviet units are running short of just about everything. The Ninth Army has neither the items requested, nor the available planes to fly them in. General Chuikov has four TB-3 and R-5 planes, but they are grounded due to the weather. He looks for alternative sources of supply, such as by truck via the taiga north of the road, but promises nothing. The issue essentially decided, there ensue various phony representations from Volkov that everything is fine, the trapped men actually have everything they need and there's nothing to worry about. General Vinagradov, commander of the trapped Soviet division, who is behind the Soviet border, orders the doomed Soviet division to break out and re-establish communications to the USSR. He also sends armored vehicles from the Scout Battalion in the USSR to break through. Both attempts fail, as the Finns have been working hard on blocking the road by felling trees and planting mines. General Siilasvuo sends two regiment-sized forces (Task Force Kari and TF Fagernas) all the way down the ice road to the Soviet border, south of Ratte. He wishes to bolt the door closed. Winter War Air Operations: The Finns turn the tables on the Soviets and drop 3 million leaflets on Leningrad. They claim to have destroyed 400 Soviet tanks and 150 Soviet planes. Western Front: The French ambush two German detachments in the Vosges Forest and take prisoners. Battle of the Atlantic: U-25 makes port in Cadiz. It spends four hours taking supplies from the German Thalia SS Thalia, then returns to sea. This is the first instance of a U-boat taking advantage of the Spanish agreement to allow such reprovisioning in Spanish ports. It is a particularly bold move because of the proximity of Cadiz to the British base at Gibraltar. U-58 (Herbert Kuppisch) torpedoes and sinks 2,475 Swedish freighter Svartön. Eleven crew survive, 20 perish. The freighter has been sailing with Convoy HN-6. British 7,267 ton freighter El Oso hits a mine and sinks near Liverpool. The mine had been laid by U-30. Three perish, 32 survive. HMS Ajax makes port at Montevideo, while HMS Achilles does the same across the River Platte at Buenos Aires. As victors of the Battle of the River Platte, they receive a celebratory welcome. US freighter Mormacsun is forced into Kirkwall, Scotland by a British patrol. The British detain US freighter Nashaba at Gibraltar, where they release US freighter Executive. Convoy OA 65G departs from Southend and OB 65 departs from Liverpool. European Air Operations: A RAF reconnaissance aircraft if brought down in Belgian territory near the German border by three Luftwaffe fighters. British Government: Contraband seized for the week ending 30 December 1939 equalled 20,800 tons. French Government: Premier Daladier reiterated that the French would assist the Finns as much as possible. German Government: The government warns the Scandinavian countries not to take advantage of Finland's distress. Italian/German Relations: Mussolini sends Hitler a letter trying to smooth over his previous critical comments about the Ribbentrop/Molotov Pact. He states: "the solution of your Lebensraum is in Russia and not elsewhere." The implication appears to be to leave France alone. US Government: President Roosevelt opens a third session of Congress. He warns that isolation is impossible, and that he intended to further peace through trade cooperation. He requests $1.8 billion for national defense in his proposed budget. Ireland: The Eire government introduces a bill to intern suspected IRA terrorists without trial. British Homefront: Unity Mitford, Hitler's erstwhile British companion, returns to the UK via Switzerland. She had shot herself on the outbreak of war, and Hitler paid for her return home. The bullet remains lodged in her skull and she is immobile. China: The Chinese 4th War Area attacks Yingteh north of Canton, while a Japanese relief force attacks the the Chinese 2nd War Area near Changze and Tunliu. 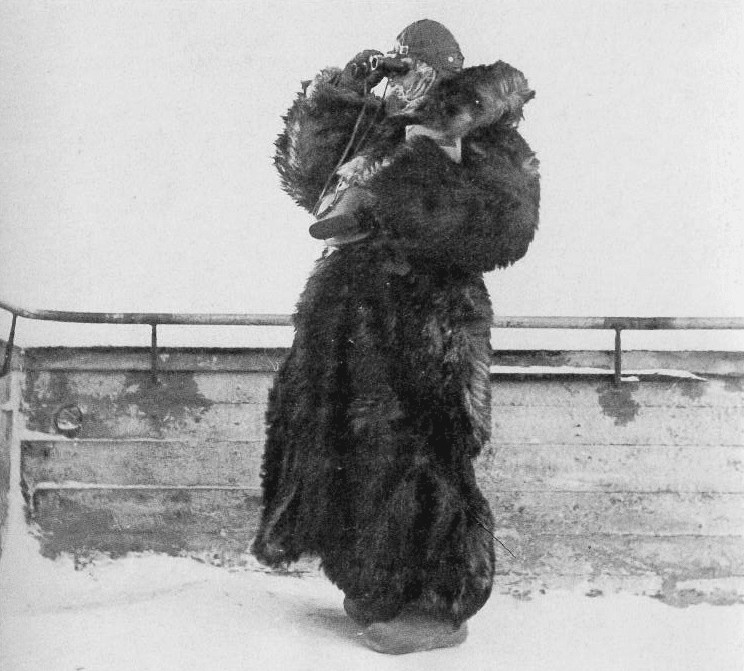 A Finnish lotta, a member of the Lotta Svärd women organisation, watching the skies for Soviet aircraft during January 1940 in northern Finland. March 22, 1940: Night Fighters Arise!